The 2016 annual Swansea and West Wales Cricket Festival was a great success, despite the disappointing results in both the one-day and four-day matches. Attendances at St. Helen’s were good, with around 2,000 people enjoying the Sunday sunshine and Glamorgan’s Royal London One-Day Cup encounter with Hampshire. Hampshire’s Liam Dawson got his side into a strong position with a 69-ball century. Glamorgan’s response got off to the worst of starts and at one stage they were 9 for 5. A fighting innings by Mark Wallace, and then further defiance from Craig Meschede and Timm van der Gugten, saw Glamorgan well past three figures, but by this stage a heavy defeat was inevitable. Showers and resultant rain-breaks on the opening day of the Specsavers County Championship match against a strong Northamptonshire side prevented an even better turn out, but the crowd was nevertheless pleasing and enjoyed some good individual performances on both sides. 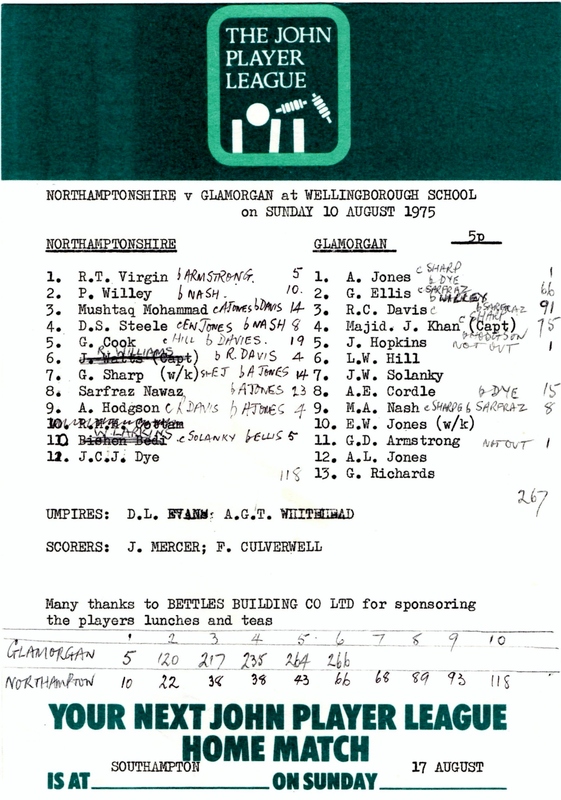 Two of Glamorgan’s notable contributions were from newcomers to the side. 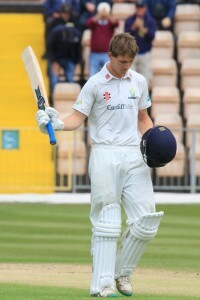 Opener Nick Selman carried his bat in scoring his maiden Championship century, the first Glamorgan player to carry his bat since Matthew Elliott in 2004. And 19-year-old debutant Lukas Carey showed great promise with the ball, recording figures of 3 for 59 and 4 for 92. The young seam bowler, a product of Pontarddulais Comprehensive School, took three wickets in his first six overs in first-class cricket! He also took the prize wicket of in-form England Lions batsman Ben Duckett in both innings. The contribution made by the historic ground to cricket has been recognised by the awarding of a prestigious Blue Plaque. The Plaque, which is situated outside the main gate in Gorse Lane, was unveiled during the lunch interval of the Specsavers County Championship match against Northamptonshire by Cllr. Robert Francis-Davies, Swansea Council’s Cabinet Member for Enterprise, Development and Regeneration. He was accompanied by Don Shepherd and John Williams, President and Chairman of the Balconiers respectively, Hugh Morris, Glamorgan CCC’s Chief Executive and Director of Cricket, and Hugh Rees of Swansea Cricket Club. Congratulations and special thanks to Sian Williams, Librarian at the South Wales Miners’ Library, Hendrefoelan Campus, Swansea, for instigating and seeing through to a successful conclusion arrangements for the Blue Plaque. More information and pictures of the 2016Festival can be found on the Cricket Festival pages of the website. 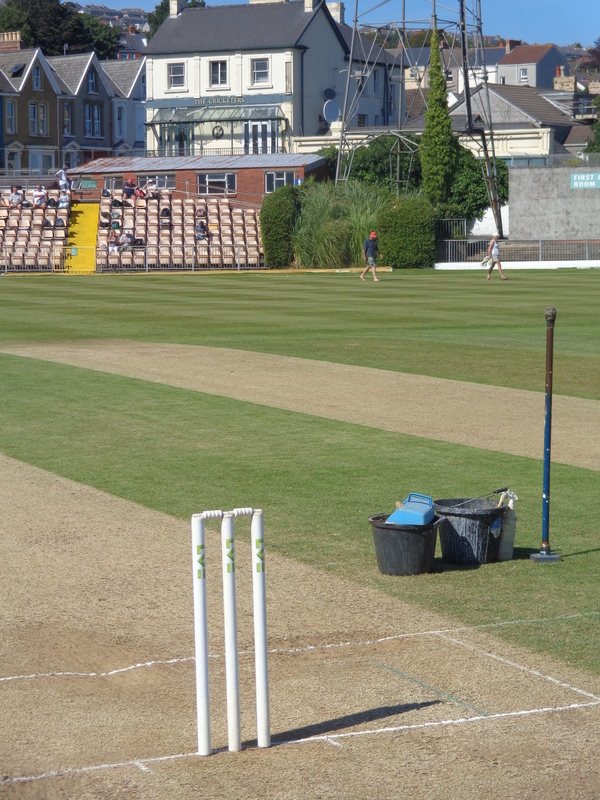 With the recent fixture release we can confirm the two games which will take place at St. Helen’s next season as part of the Swansea and West Wales Cricket Festival. The Royal London One-Day Cup match will be on Sunday 14th May against Kent (probably starting at 10:30am, to be confirmed). Then on Friday 2th May, will see the start of the Specsavers County Championship game where Durham will be the visitors for the four day match. Play will start at 11am. We’ll bring you more details of the Cricket Festival nearer the time. And don’t forget, Country membership of Glamorgan CCC would entitle you to attend all five days of the Festival for only £62. A full and exciting programme of supporters’ residential visits to away matches has been organised for the 2017 season. All details are on the relevant pages of the Daffodil Tours section of this website. St Helen’s or St Helens? The recent award by the Council of a second Blue Plaque for St Helen’s – this in recognition of its historical significance as a cricket venue – has rekindled the debate on the apostrophe. But we in the Balconiers are pro-apostrophe! As our President Don Shepherd has, we in the St Helen’s Balconiers have always included the apostrophe in our title, and would regard this as the traditional and correct form. Indeed, as far as we can tell this spelling of St Helen’s, with the apostrophe, has been used in all documentation relating to first-class cricket at the ground since the first fixture in 1921. 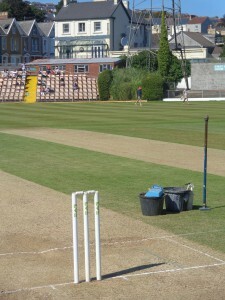 This includes all score-books, score-cards, tickets, advertisements – in short, everything relating to Glamorgan cricket at this most historic venue. Going back further, 1868 saw one of the first cricket matches ever at the ground – a South of England XI (led by Dr W.G. Grace) against Twenty-two Men of Swansea – reported by ‘The Cambrian’ newspaper (predecessor of ‘ The South Wales Evening Post’) as having “commenced on the new field at St Helen’s”. So tradition is very much on the side of the apostrophe! The 2002 book Glamorgan Grounds: The Homes of Welsh Cricket by Glamorgan CCC Scorer and Archivist Dr Andrew Hignell includes a chapter on St Helen’s (always with the apostrophe) in which he reminds us that the ground ‘takes its name from a convent dedicated to Saint Helen’. Our cricket is played on the land of St Helen – thus the use of the apostrophe to indicate possession. So it would seem that those urging retention of the apostrophe have grammar on their side as well as tradition! The Evening Post article by Chris Peregrine (Spell check time for St Helen’s or St Helens: 19.11.15) may be found on the Post’s website. We shall seek permission to include it in our Archive in due course. 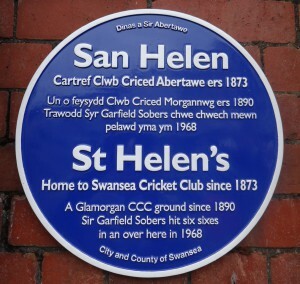 Soon after St Helen’s hosted the highly successful 2015 Cricket Festival, the welcome announcement was made by Swansea Council that the ground would be honoured by the award of a Blue Plaque in celebration of its sporting tradition and significance. It has subsequently been announced that the ground will, in fact, receive two Blue Plaques. 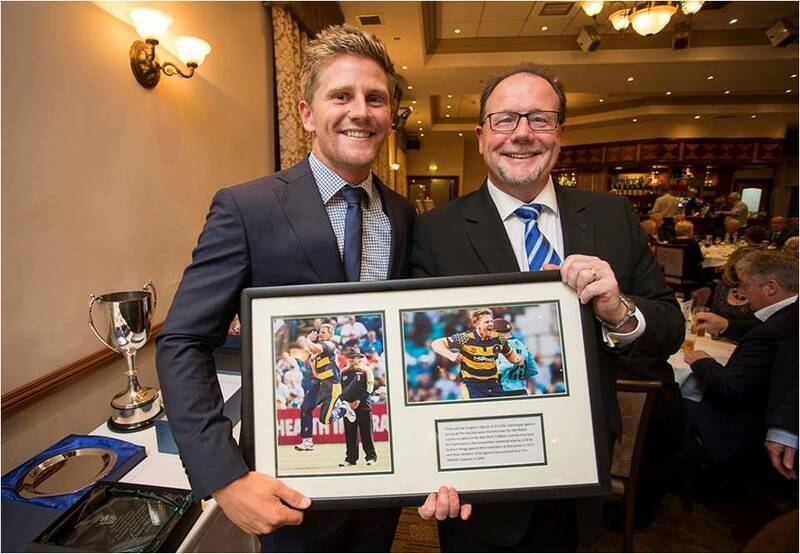 In the weeks following the original announcement, it emerged that the award was essentially celebrating the rich rugby history and tradition of St Helen’s. But the Council has readily agreed to the suggestion of a second plaque, this one acknowledging the cricketing heritage of the ground and its huge significance in the history and development of Glamorgan cricket. An editorial in the South Wales Evening Post (24.10.15) notes that “there is no denying its place in the hearts of a sport-loving city, many of whom still reminisce about the great days at St Helen’s”. 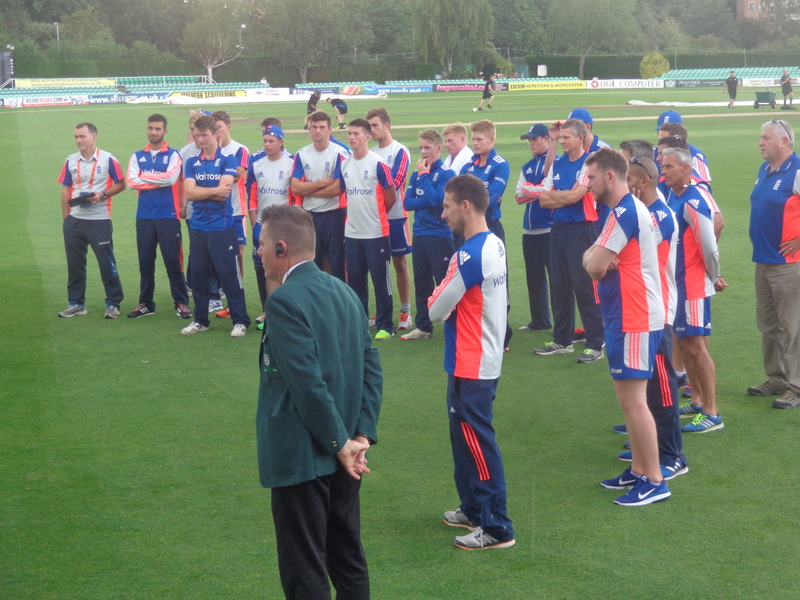 He also stressed the continuing importance of St Helen’s in Welsh cricket through the annual Cricket Festival. A similar letter was published in the Western Mail the same day. Like the Post letter, it has been very well received and drawn considerable positive comment. We’ll post further information about the Plaque – and details of the unveiling – when we have them. An Evening Post article by Gary Gregor (Sports ground with more than just a rugby history, 24/25 October 2015), in which he looks at the case for honouring the cricket traditions of St Helen’s (and mentions “the sterling efforts of the Balconiers”), may be found on the Post’s website. We shall seek permission to include it in our Archive in due course. 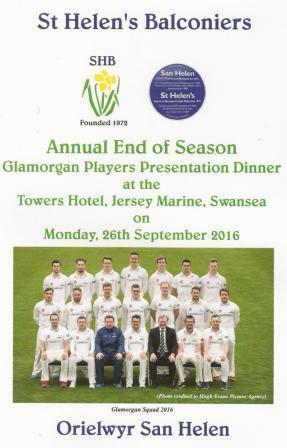 The 2015 Balconiers’ Annual Presentation Dinner took place at The Towers Hotel, Jersey Marine, Swansea on Monday 28th September. This event continues to be the highlight of the Balconiers’ end-of-season attractions and becomes more and more popular each year. 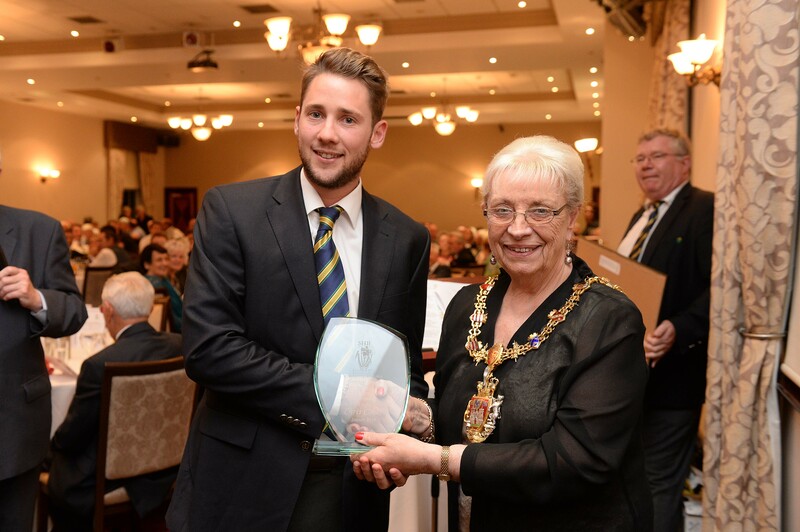 The Balconiers welcomed 200 people to the evening to celebrate a number of awards for the Glamorgan team. 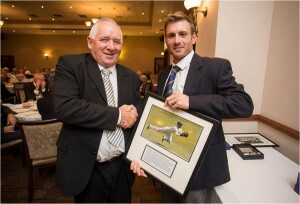 Graham Wagg was named the Balconiers’ and Glamorgan Player of the Year. 2015 was the best ever for the all-rounder with Wagg enjoying a successful season with both bat and ball; scoring 1160 runs and taking 60 wickets in all formats of the game. Of those runs, 842 were made during first-class cricket, whilst he was the club’s leading all-rounder in the Natwest T20 Blast, making 209 runs and picking up 13 wickets. 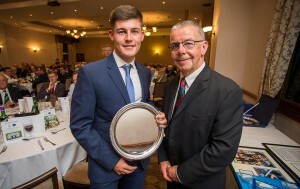 More memorable moments from Wagg’s impressive season and a full list of award nominees and winners can be found on the Balconiers and Glamorgan Awards Dinner page. This year’s AGM was held at The Towers Hotel & Spa, Jersey Marine on Monday, 28th September 2015. 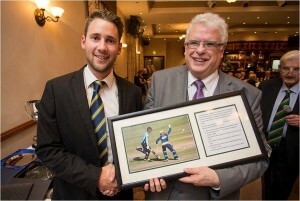 It preceded the Glamorgan Players’ Annual Presentation Dinner. There were no new elections and so the Committee remains the same for 2016. 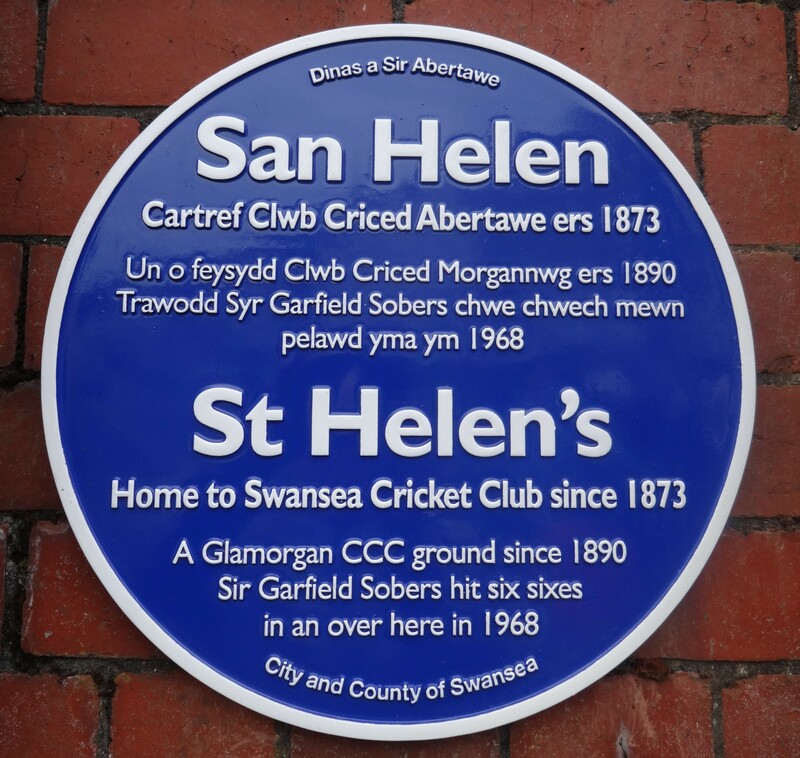 The huge significance of the St. Helen’s ground in Welsh and international sport for over a hundred years has been recognised by the awarding of a prestigious Blue Plaque. The plaque will soon be sited close to the clubhouse steps leading to the pavilion. The award, by Swansea Council, recognises the prominent part played by the ground in sporting history – in particular, in cricket and rugby. 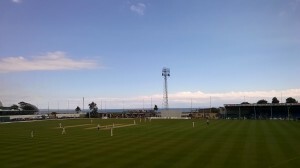 Ever since its opening, St. Helen’s has been the home of Swansea’s rugby and cricket clubs. It has also been the venue for Glamorgan matches since their entry to the County Championship in 1921, and still continues to host the annual Swansea and West Wales Cricket Festival. Among many notable international cricketing occasions the ground has seen are Bradman’s appearance with the 1938 Australians, victory over South Africa in 1951 in front of a last day crowd of 24,000, and victories over the Australian touring teams of both 1964 and 1968 – the latter under the captaincy of the Balconiers’ own Don Shepherd! And in a ground which has seen so many memorable team and individual performances, it was West Indian star Gary Sobers, playing for Nottinghamshire in 1968, who put the ground on sports pages and TV screens around the sporting world when he scored a world record six sixes of a Malcolm Nash over. 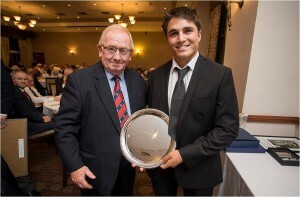 Glamorgan’s highly promising Swansea-born batsman Aneurin Donald, who has also enjoyed Club success with both Gorseinon and Mumbles, captained the England U19 team in its recent five match Royal London 50-over series against a strong Australian U19 side managed by Glen Chappell and coached by Graeme Hick. Aneurin, a product of the Glamorgan Academy, made his home first-team Championship debut at the recent Swansea and West Wales Festival at St. Helen’s – and was disappointed not to have put in a better performance with the bat, especially having scored 50s in his two away appearances with the first-team. 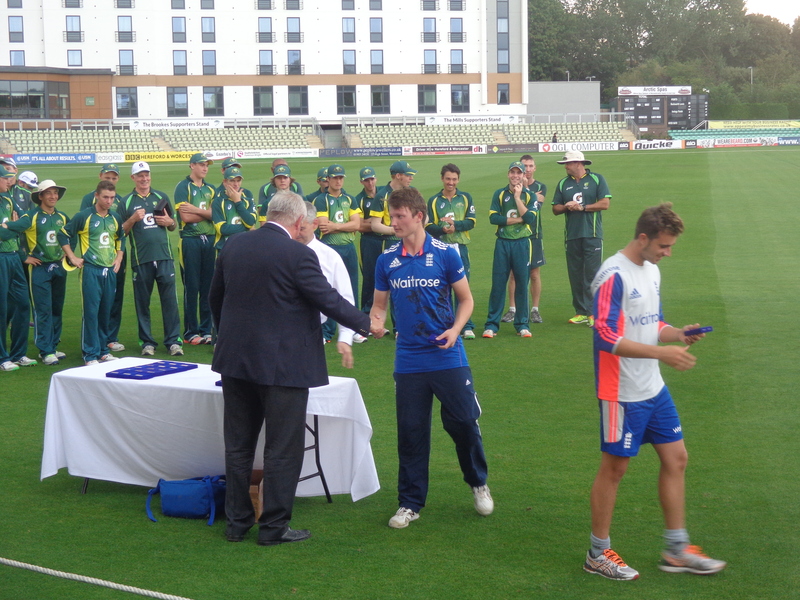 His captain’s innings of 38 (off 31 balls) towards the end of the fifth and final match of the U19 international series at New Road, Worcester, was significant in England successfully chasing down Australia’s imposing target of 294 with two balls of the final over remaining. 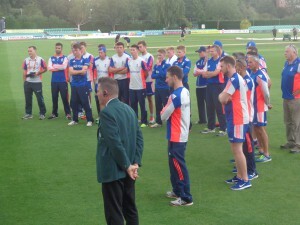 England’s win, build around a second century in the series by Essex batsman Dan Lawrence, meant that the series was drawn, each side securing two victories with one game abandoned due to rain. 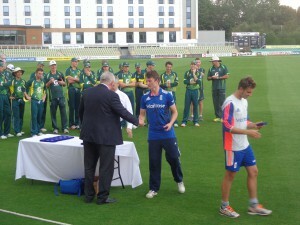 It was a proud moment for Aneurin as he received the shared trophy. 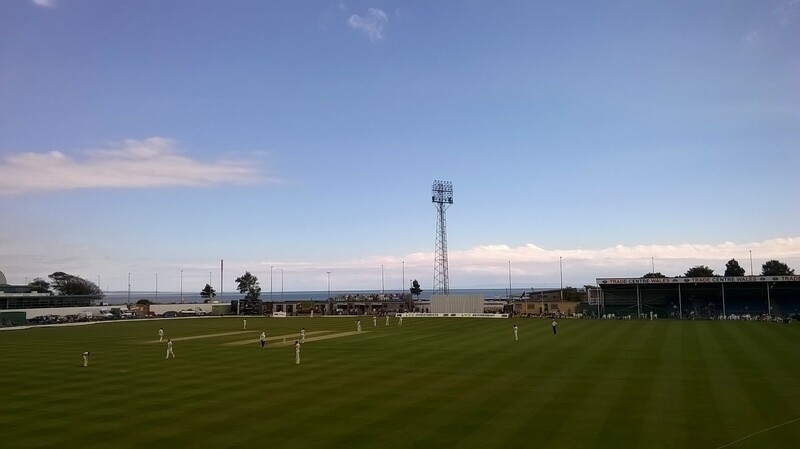 The Festival was another outstanding success and another great advert for cricket at the historic Swansea ground – despite the loss to rain of the limited over Royal London One-Day Cup match v. Sussex on the opening day of this year’s St. Helen’s programme. Only 6 overs were played before rain set in and got progressively heavier, the umpires eventually having no alternative but to abandon the match to the disappointment of a large crowd that had turned out despite the poor weather predictions. But the weather recovered and the sun shone for the start of an exciting game of fluctuating fortunes against Gloucestershire. Captain Jacques Rudolph anchored Glamorgan’s first innings with a careful 68, but wickets fell regularly the other end. When Rudolph was dismissed at 146-7, Glamorgan were in trouble. But a delightful innings of 73 by Andrew Salter, in partnership first with Mark Wallace and then with Kieran Bull (who enjoyed a ninth wicket stand of 90 with Salter), saw Glamorgan to the comparative respectability of 299. But a series of useful contributions by Gloucestershire batsmen saw the visitors’ reply pass 400. Salter and Craig Meschede got 3 and 4 wickets respectively, and Michael Hogan once again proved very difficult to score off, taking 2-59 in 29 overs. 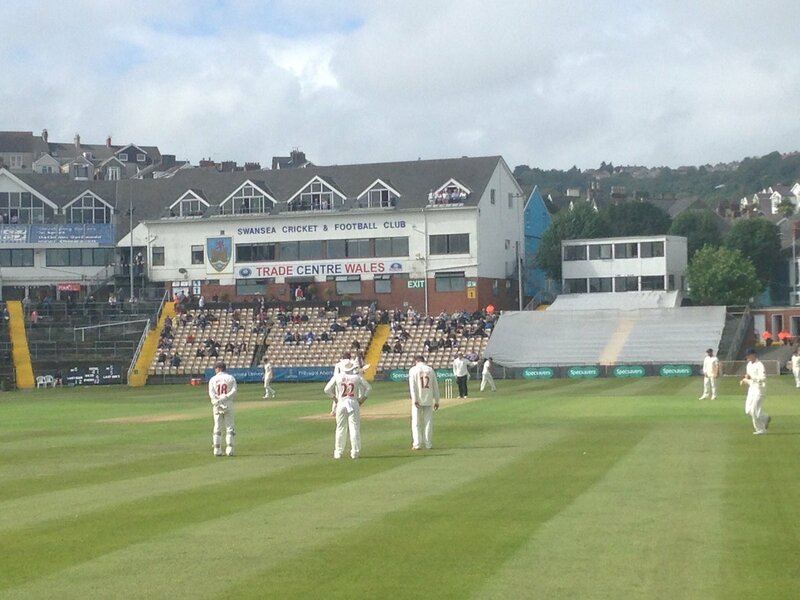 Glamorgan were soon in trouble in their second innings, with three key batsmen falling before the completion of the tenth over. When the eighth wicket fell at 132 it looked as if the match would finish before the close of play on the third day, but again Andrew Salter had other ideas! A ninth wicket partnership of 33 with Kieran Bull was followed by a last-wicket partnership of 59 with Michael Hogan. The Australian fast-bowler’s clean, hard-hitting in a thrilling innings of 37 not out (to go with his first-innings contribution of 18 not out) was an exciting conclusion to Saturday’s play. Despite a couple of scares along the way, Gloucestershire reached their victory target of 108 on the final morning, Chris Dent and Hamish Marshall seeing them home. It may have been a disappointing result, but everyone agreed that it was an interesting game to watch. Entertaining individual performances from players on both sides, and a large and knowledgeable crowd, combined to provide another successful and enjoyable Festival. The Balconiers have received a number of very positive comments from visitors to the Festival, several mentioning the ‘delightful ground’ and ‘superb panoramic views’ – and all mentioning what one visitor summed up as ‘a wonderful, warm Swansea welcome’. Thanks are due once again to Peter Lynn & Partners, the main Festival sponsors, and all the other sponsors; to the local business community who once again supported through hospitality sales; to all the staff and volunteers who helped to make the event run so smoothly; to the players who gave us such entertaining play; and to everyone who came to watch and enjoy cricket at our lovely old ground! 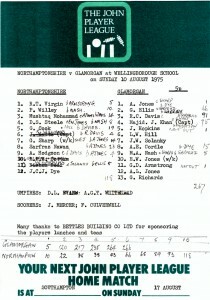 The traditional Friday Evening Buffet during the St. Helen’s Festival focussed on ‘Majid’s Magical Years’ and included rare BBC archive film of Majid Khan’s record-breaking Sunday League innings against Northamptonshire at Wellingborough School on 10th August 1975 – the fastest televised 50 off only 22 balls! Four of Majid’s team of 1975 – Alan Jones, Eifion Jones, Malcolm Nash and Don Shepherd (the first three having played in the Wellingborough game) – reminisced about his nine seasons with Glamorgan in an informative Q/A session chaired by Glamorgan scorer and archivist Andrew Hignell, who also sourced the film and introduced the evening. As always, guests were well fed and looked after by the hard-working catering staff led by Chef and Catering Manager Mark Davies. The Royal London One-Day Cup match will be on Wednesday 5th August against Sussex, starting at 10:30am. The following day will see the start of the LV County Championship game where Gloucestershire will be the visitors for the four day match. Play will start at 11am. 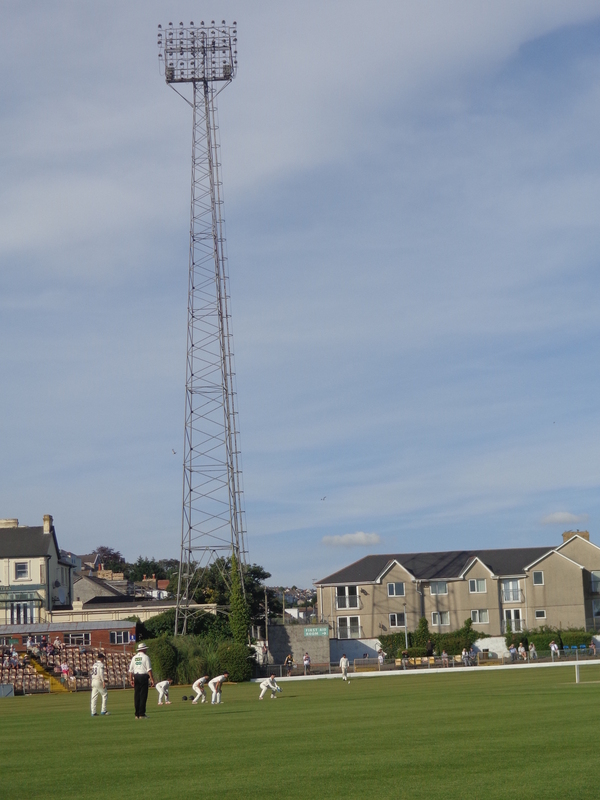 Jacques Rudulph scored a record-breaking 169 when Sussex and Glamorgan met in last season’s one-day competition, so expect some big blast sixes into the Mumbles Road when the two teams meet again in August. And don’t forget, Country membership of Glamorgan CCC would entitle you to attend all five days of the Festival for only £60. 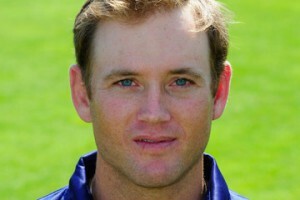 Fellow South African international Colin Ingram joins new skipper Jacques Rudolph, and is on a three year contract. 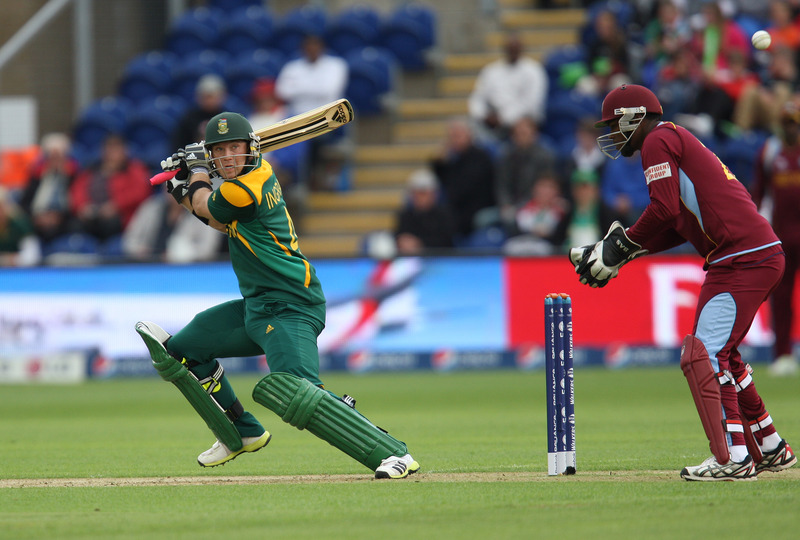 Colin is a left-handed batsman of considerable repute who has played in 31 ODI games for South Africa. He is also currently captain of The Warriors, for whom he is averaging 76 with two centuries and two half-centuries in only four games. Two further exciting new recruits are opening batsman James Kettleborough from Northamptonshire and all-rounder Craig Meschede who joins on a one-year loan from Somerset. A warm welcome to all three new signings – we look forward to seeing you in action for Glamorgan – and at St. Helen’s. 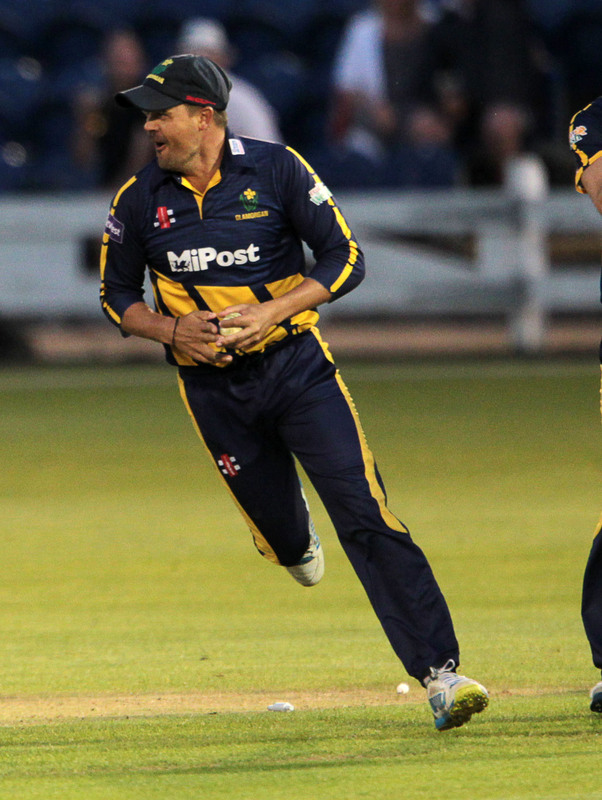 The 2015 Festival will see Glamorgan playing under a new captain with Jacques Rudolph taking over as skipper. The Balconiers wish Jacques every success in his new role with Glamorgan – he has already had captaincy experience having led both South Africa A and The Titans. 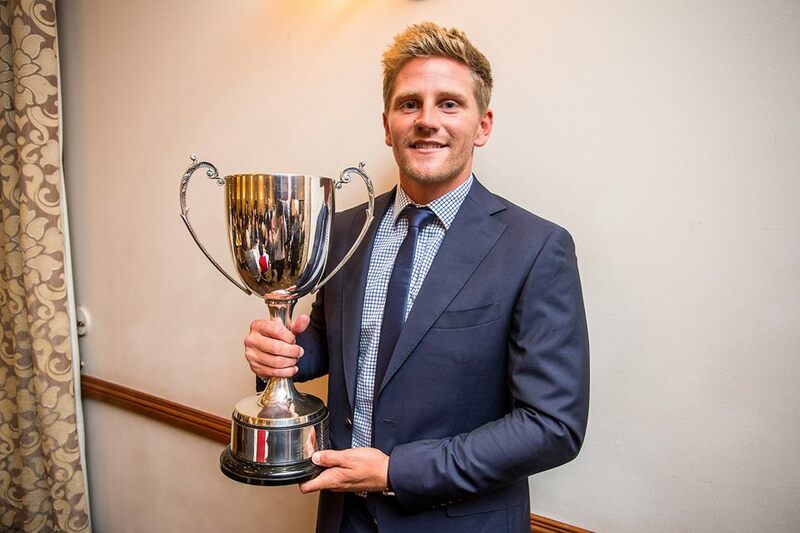 He was the county’s leading run scorer in 50-over cricket last summer with 575 runs at an average of 82.14. In our one-day game against Sussex at Hove in 2014 he scored 169 – the highest total by a Glamorgan player in List A cricket and beating a record previously held by Viv Richards. 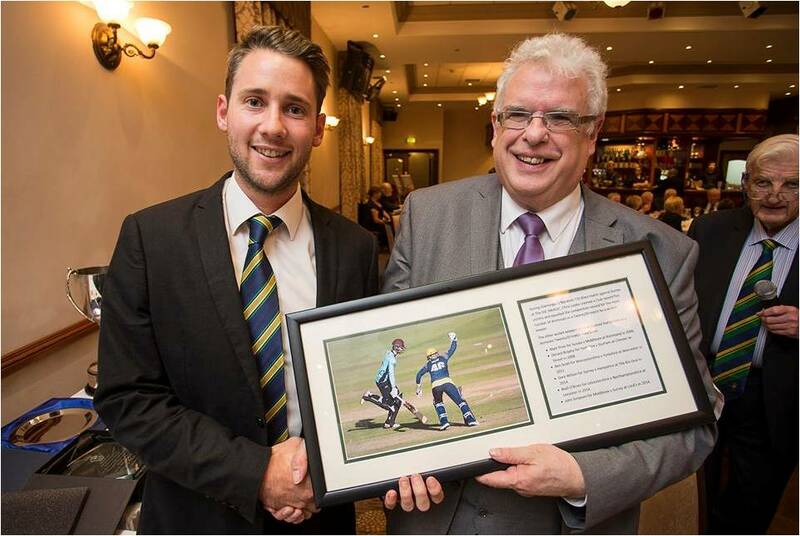 Another successful evening was held to mark the end of the 2014 cricket season and the stand out performances of the Glamorgan players over the summer. It’s an event organised by the Balconiers in conjunction with Glamorgan County Cricket Club to celebrate successes and give out around 30 awards. Over 200 people attended the event held at The Towers Hotel, Swansea to be part of the celebrations. The most coveted award of the evening is the Balconiers’ Glamorgan Player of the Year Award. This year’s recipient was overseas player Michael Hogan, for the second year running. The Australian was given the award for leading the Glamorgan bowling attack over the season with great commitment and vigour. 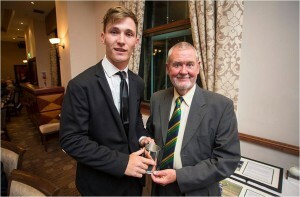 Michael Hogan – Balconiers’ Player of the Year 2014 – receives his award the the Balconiers’ President, Don Shepherd. 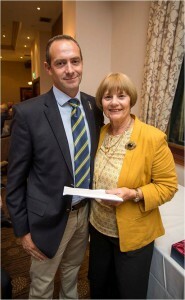 Club captain Mark Wallace was given a special award to mark being the first cricketer for 38 years to appear in 200 consecutive County Championship matches. 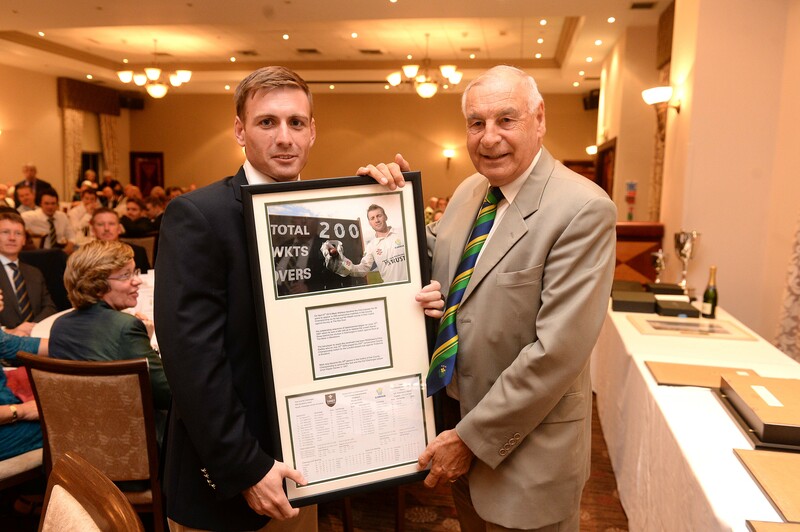 This milestone was reached during Glamorgan’s game against Surrey at the Oval in April 2014. The last player to do this was also a wicketkeeper – Haydn Davies back in 1957. 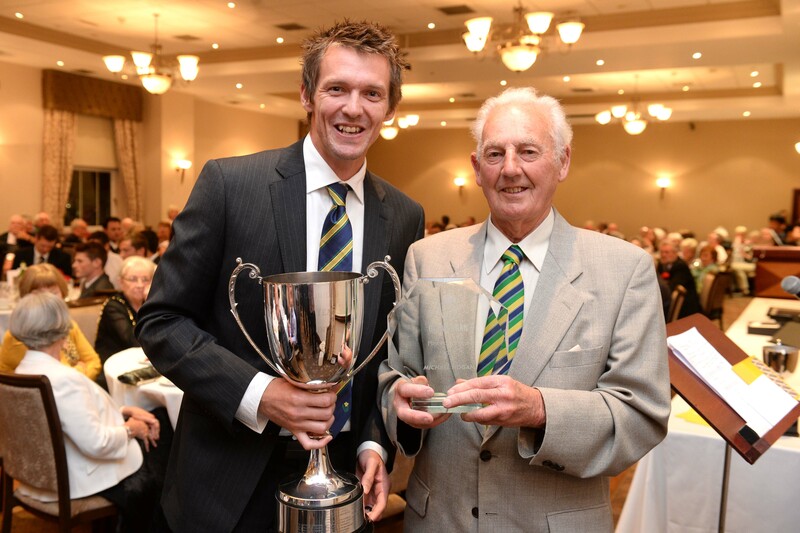 Wicketkeeper Mark Wallace receives a Special Award from Balconiers’ Treasurer Clive Hemp to mark 200 consecutive County Championship appearances for Glamorgan. 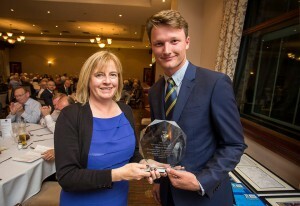 Chris Cooke received two awards on the evening for his cricket achievements over the summer. 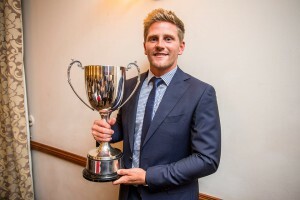 The batsman was given the Gerry Munday Award – for the most improved yet uncapped player and Chris was also awarded the County Championship Player of the Year as well. A successful evening! 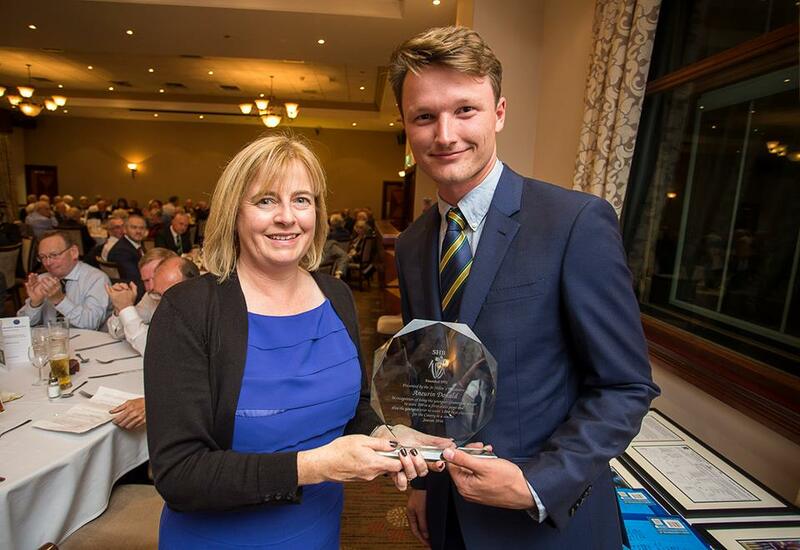 Chris Cooke receives his Gerry Munday Award from The Lord Mayor of Swansea – Councillor Ceinwen Thomas. The rest of the evening’s awards and some more pictures can be found in a full report by Balconiers’ Secretary Allan Gray on the Balconiers’ & Glamorgan Awards Dinner page. 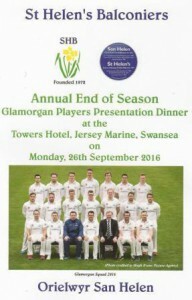 If you attended this season’s Dinner and are already looking forward to the next one (or perhaps can’t believe you missed all the awards and want to make an early note of the date for this season), the provisional date for 2015 is Monday 28th September at The Towers Hotel, Swansea. Further details, including ticket price, will follow in due course. As usual, the Awards Evening will be preceded by the Balconiers’ AGM. 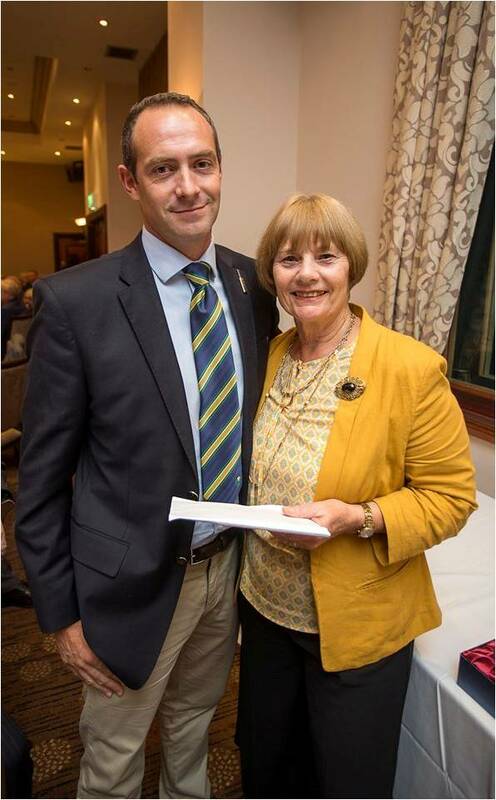 Former Glamorgan captain Ossie Wheatley was one of a number of special guests who attended a celebratory evening to mark the 50th anniversary of Glamorgan’s famous victory over the Australian Tourists. Glamorgan’s popular ex-captain was joined by six other members of the team to play in the historic St. Helen’s match – Don Shepherd, Alan Jones, Eifion Jones, Alan Rees, Billy Slade and Peter Walker. More information and photographs of the evening can be seen on the Celebratory Evenings page. This year we are delighted to again have Peter Lynn and Partners Solicitors as our main sponsor for the Swansea and West Wales Cricket Festival. There is still the option to sponsor the Festival in other ways. Please see the Hospitality & Sponsorship page for more details. It is with sadness that we record that former Balconiers Committee Member passed away at Singleton Hospital on Tuesday 2nd September 2014. Owen was a member of the Committee during the late 1980s and throughout the 1990s and was a regular on the Daffodil Cricket Tours often the tour leader when John Williams was not available. As Balconiers we extend our sincere condolences to his family at this sad time. It is with sadness that we record that former Glamorgan batsman Bernard Hedges has passed away at the age of 86. He had a very successful 18 year first-class cricket career between 1950 – 1967. Bernard was one of the county’s all time highest run scorers with 17, 733 runs. He died at his home in Mumbles on 8th February 2014. Glamorgan historian and scorer Dr Andrew Hignell has written a tribute to Bernard which can be found on the Glamorgan website or click here.